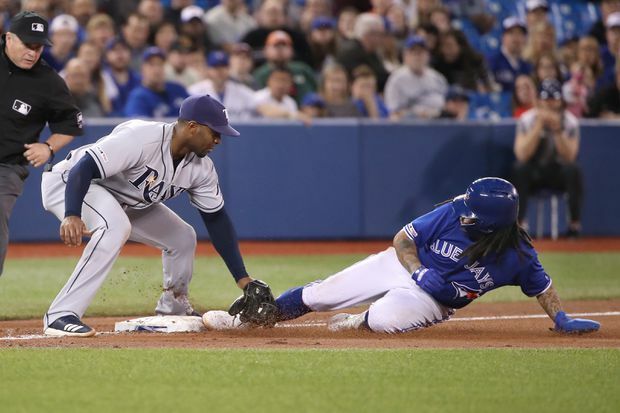 Freddy Galvis (16) of the Toronto Blue Jays is tagged out by Yandy Diaz (2) of the Tampa Bay Rays as he tries to advance to third base on a wild pitch in the seventh inning during MLB game action at Rogers Centre on April 12, 2019 in Toronto. heaving Tampa Bay Rays baseball swag out onto the floor. The treasure trove included a selection of team T-shirts along with several giveaway bobbleheads from days past. There was even a hand puppet featuring team mascot DJ Kitty amid the clutter. “You guys can have it, all the Rays people gave me this stuff,” said the Toronto Blue Jays manager with a wave of his hand – all good-naturedly, of course. Before he became the new manager of the Blue Jays this season, Montoyo laboured for 22-years in the Tampa Bay organization, the last four on the big-league staff of Rays’ manager Kevin Cash. With the Rays in town Friday night to begin a three-game series against the Jays at Rogers Centre, it marked a reunion for Montoyo and his old employer. And the Rays commemorated the moment by dumping the load of memorabilia on Montoyo’s doorstep. The high-flying Rays (11-3) then hand-delivered a stiff jab in the nose to Toronto in the opening game, using their power to build a big early lead and then hanging on for an 11-7 victory before just over 17,300 spectators. The Rays hit five home runs, two each by Austin Meadows and Brandon Lowe, who delivered monstrous blows in Tampa Bay’s four-run third inning off Toronto starter Trent Thornton, when they took a 5-0 lead. Both those homers were moon shots, landing in the fifth deck in right field at Rogers Centre. It marked the 21st and 22nd time in the stadium’s history that homers have travelled into the building’s upper reaches. It was the first time it has occurred twice in the same game. Willy Adames socked the other Tampa Bay dinger in the top the ninth where the Rays tagged on three more to finally ice things. In a move that is expected the be announced Saturday morning, the Blue Jays will option utility infielder Richard Urena to Buffalo to make room for pitcher Clay Buchholz. While those Rays souvenirs were deemed expendable, the Blue Jays are eagerly awaiting the delivery of a more highly valued gift they won’t be so eager to part with. That prize’s name is Vladimir Guerrero Jr., the top prospect in major-league baseball whose arrival this week at the Blue Jays top Triple-A affiliate in Buffalo has set the fans agog in anticipation of a rapid promotion to the big-league club. His one-game minor-league outing was enough to prompt Toronto general manager Ross Atkins on Friday to answer, again, the question of when the third baseman might see a Blue Jays uniform. Many are of the belief the sooner the better, to help deflect some attention off a rebuilding team that is bracing for plenty of setbacks. And for the umpteenth time, Atkins gave his regular cryptic response. In other words, the Blue Jays, no matter the outside pressures, will not promote Guerrero until they are ready. After a solid start to his rookie campaign, in which he set a franchise record with 15 strikeouts in his first two outings, Thornton was brought back to earth against the free-swinging Rays. Thornton lasted only three-plus innings where he was rocked for five runs off eight hits by the Rays, who are the early season class of the AL East. Tampa Bay won for the fifth consecutive outing to remain alone in first place. The Blue Jays fell to 4-10. Returning home after a 1-5 trip, the Blue Jays did not register their initial hit Friday until the fifth inning. Having collected just two hits through six, the Blue Jays caught life in the seventh, batting around for six runs to trail the Rays 8-6. Lourdes Gurriel Jr. swatted a two-run double during the blitz while backup catcher Luke Maile later added a two-run home run. Toronto scratched its way back to within one of the lead with a run in the bottom of the eighth, but it could have been much more with Maile striking out looking with the bases loaded.